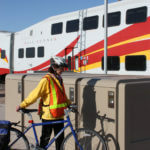 CycleSafe serves planners for transit, education, corporate, government, and healthcare facilities by providing bicycle solutions with the best in quality, innovation, and reliability. Our products help achieve healthy, sustainable communities and increase employee productivity and retention. Our high standards and engineered quality make our products the number one choice of facility planners worldwide. These case studies illustrate our commitment to communities through our extended product life and promotion of cycling with ease of use and dependability. CycleSafe bike lockers and bicycle parking systems are selected by more agencies and companies worldwide than any other bicycle storage unit.